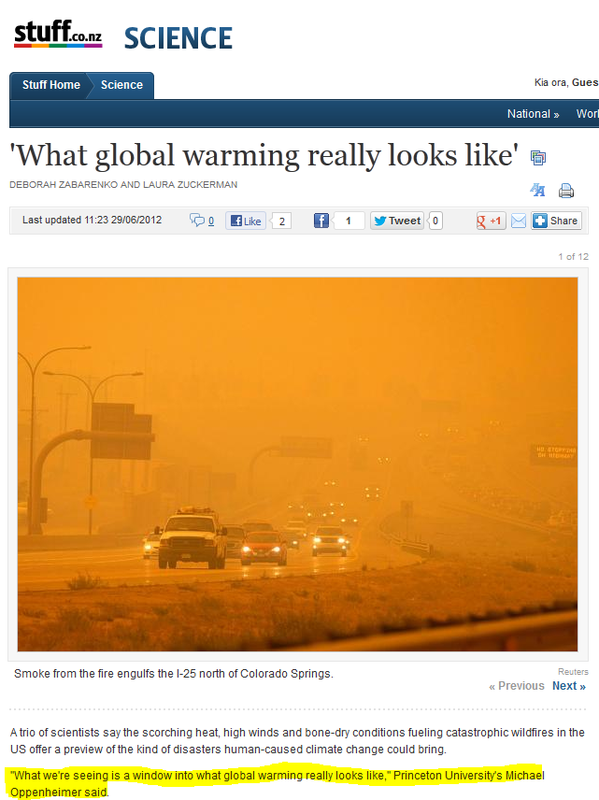 'What global warming really looks like' – Michael Oppenheimer FAIL | Watts Up With That? The usual suspects put that document together. See below. Now with a telephone press conference, Climate Nexus seer Michael Oppenheimer says he knows “what global warming looks like”, and it apparently is a hazy yellow-orange. In Colorado, wildfires that have raged for weeks have killed four people, displaced thousands and destroyed hundreds of homes. Because winter snowpack was lighter than usual and melted sooner, fire season started earlier in the US, with wildfires out of control in Colorado, Montana and Utah. The high temperatures that are helping drive these fires are consistent with projections by the UN Intergovernmental Panel on Climate Change, which said this kind of extreme heat, with little cooling overnight, is one kind of damaging impact of global warming. The stage was set for these fires when winter snowpack was lighter than usual, said Steven Running, a forest ecologist at the University of Montana. Full article here h/t to reader Alwyn Poole. I wonder, did global warming look like this same yellow-orange hazy hellfire back in 1988 before Jim Hansen turned it into a cause? Such wildfires occurred across much of the ecosystem in the 1700s. But that, of course, was prior to the arrival of European explorers, to the designation of the park, and the pattern established by its early caretakers to battle all blazes in the belief that fire suppression was good stewardship. Throughout much of the 20th century, park managers and visitors alike have continued to view fire as a destructive force, one to be mastered, or at least tempered to a tamer, more controlled entity. By the 1940s, ecologists recognized that fire was a primary agent of change in many ecosystems, including the arid mountainous western United States. In the 1950s and 1960s, national parks and forests began to experiment with controlled burns, and by the 1970s Yellowstone and other parks had instituted a natural fire management plan to allow the process of lightning-caused fire to continue influencing wildland succession. We are living in the age of crazy. The founder and purveyor of Watts Up With That, the premier climate realist website and blog (twice the winner of the Best Science Blog), the estimable Anthony Watts, has posted some of our fire graphs [here]. The EPA is doing in putting its support behind global warming alarmism–empowering overreaching Leftists to take full advantage of credulous and thoughtless dimwits. The EPA is hiding the truth, hiding the decline, hiding the immorality and the harm to the public and to the culture and to all the kids in the dropout factories whose futures are being wiped out. We passed simply the “age of crazy” a long time ago. And they wonder why they’re losing credibility with the public…. These people are (at best) delusional. Useful idiots..? Mate, that looks like summer in Australia – and we normally have these massive Sikorski Sky Crane Helitankers flying around that we lease from somewhere – the US of A I think. The most destructive forest fire ever recorded (in the world) was in 1871 in Wisconsin. 1200 people died. In fact, the top 5 worst forest fires in terms of loss of life are all pre-1920 and all in N America. Broad brush … droughtyness in the Western US always looks like Global Cooling to me. La Nina (at least up until recently) – check. Weak solar cycle – check. If the Colorado fires are because of global warming, which Obama says he wants to fight, then why did he cut back the tanker-plane fleet? Answer: isn’t Colorado leaning Republican? Are people any more crazy today, than say a couple of hundred years ago when the most commonly used medical treatment was blood-letting? By the way, there has been at least a brief respite in the Colorado heat. It’s currently 83F with scattered showers. Oregon was ablaze at the turn of the 20th century. We don’t come close to what it used to be. This “We are all going to burn!” is a prime example of drumming up scary stories to convince weak minded folks to let their pockets be picked on a global scale. Given the recent Supreme Court decisions in the US, if we the people don’t take back control over our own destiny, we are in for worse than the scary story this post highlights. “In Melbourne the day opened with a scorching north wind and an unclouded sky. Under the influence of the fierce sirocco the city was soon enveloped in blinding dust, and by 11 o’clock the thermometer marked 117 degrees ( 47.2 Celsius ) in the shade. By midday, rolling volumes of smoke began to converge on the city, and outdoor life became intolerable. The streets were almost deserted, a dull sense of suffocation oppressed even those who cowered in the coolest recesses of their homes, and anxiously asked what it meant. Fortunately no fires broke out near the city, for had it once done so, in all probability the whole place would have fallen. With sunset came a change of wind to the south, and anxious crowds gathered towards nightfall on the summits of Batman’s Hill and the Flagstaff Reserve to note with awe and wonder the red glare that marked the Dandenong Ranges and illuminated the whole of the northern horizon. This is a passage from H. G. Turner’s “History of the Colony of Victoria “. The devastating fires Turner refers to are the Black Thursday fires which took place in 1851, on 6 February and subsequent days. The extent of land burned, 5 million hectares, has not come anywhere near being equaled by any other Victorian bushfire event since European settlement. Victoria also suffered significant flooding events during that same year. Mr. Watts, it is reaching the point where more people are reading the cagw point of view on here than through their press releases. You are (unintentionally) propagandizing the alarmist position, and you have been doing this since the Heartland forgery incident. I liked it better when the website was more purely focused on the science. @ David McKeever – Its a “damned if I do, damned if I don’t” proposition. But please do see the update I made. Regular controlled burns would make a big difference too (under proper moist conditions), but the smokey bear mentality that all fires are bad would have to be overcome. Alas, I regret this requires a higher thought process than the masses have been able to achieve. Oh come on, Anthony. The fires are disasters, aren’t they? Of COURSE they are caused by Global Warming–just like droughts, floods, sea level rises, hurricanes, earthquakes, record heat, record cold, warm winters, cold winters and about 200 other items on that list you are keeping. Couldn’t agree more Anthony – there are just too many confounding factors to link this simply to climate. The Western Australian experience is that 1) there are more fires during school holidays 2) Wildfires are commonly due to changes in fuel control – though the last major one was caused by a fuel control burn that got out of hand and 3) People’s memories are short so after a while without a wildfire, fuel control becomes less important to people. However, in 1978 there appears to have been a step change in global rainfall, which inevitably will have led to a steady drying out of the environment over time. Some of the rise in acreage could be caused by that. One would still need to make several links to see this as a product of AGW though. People who have never fought a forest fire should be prohibited from commenting on their cause. We have only spent 100 years fighting and trying to prevent all wildfires. Mom Nature is striking back for our hubris. 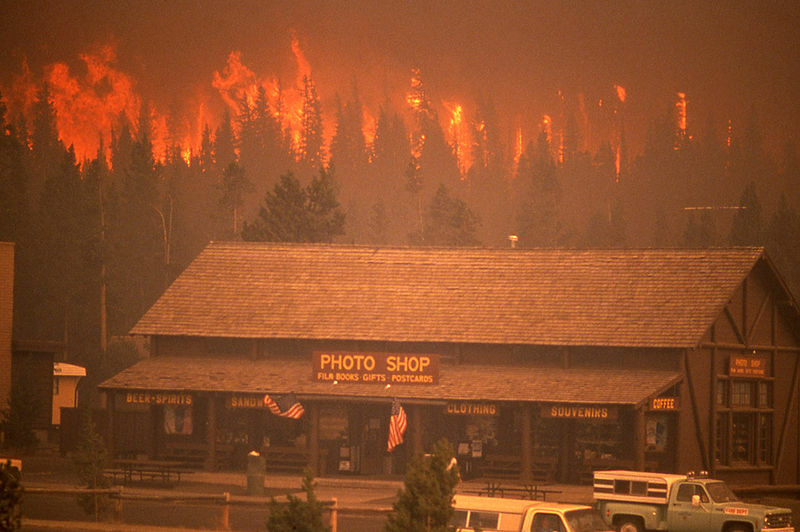 Does anyone remember Yellowstone 1988? Rather it is a window into the minds of charlatans. Colorado has been cooling for decades. These forests thrived because of increased cooling and rainfall. Like the artificially managed forests in California, often Eucalyptus and non native pines rather than the indigenous oak, these forests are dangerous in summer. We can expect to see more forest fires in the future? Wow, no kidding? Thanks Einstein. I was in Jellystone last fall, and signs of the ’88 fires are all over. But there’s tons of new growth in those same areas, as is the design for forested areas. As for the above mentioned controlled burns, they’re doing them from Alaska to New Mexico, but they’re far behind the curve. Good on em for getting started on it though. Don’t you just get sick of these Alarmist Opportunists. Turning any event into a GW PR Propaganda Spin. Had that down here in NZ/OZ during those large bushfires in VIC a few years back. Bushfires to be more extreme because of GW. Of course those bushfires were mainly a result of Arson, carelessness and stupid ECO-green laws making it worse. Due to not allowing proper fire breaks around properties, etc. SO GW wasn’t the real cause. ALL scientific evidence supports the opposite, warmer times were greener and wetter. Alert, be wary of those photographs. US Air Force handout mentioning fire retardant, orange water? If the link works this is the reuters slideshow containing the above and the headline photo at WUWT. Can someone tell me how a supposed AGW caused increase of 2C in global average temperatures can ignite a fire? Thank you in advance. Click on the images to get the full size. I love to show that to people. Most have no clue that we have been so lucky. Are these fires fueled with dead and dying Lodge Pole pines planted en mass about 90 years ago? The above article also says that this would allow more water from melting snow and rain to flow into waterways where it would become available to the people of a parched West. Notice how Oppenheimer slides from the extreme heat/warmer nights thing, which I understand the IPCC has indeed ‘projected’, to severe storms, floods and droughts, which I understand the IPCC is very circumspect about these days? Leaving aside the validity of the IPCC’s claims (which I doubt anyway), why does he misrepresent what they are saying? Not that it is likely any of the scientists or authors whose work he claims to be quoting seem likely to contradict him. We in Australia know a thing or two about bushfires, and having experienced a massive one, I can assure readers that in hot, dry conditions, with a hot wind blowing, and trees, scrub or grass to burn, no human force can stop it. All the finger-pointing about firefighting resources, reducing fuel loads etc is trivial when you are faced with a mega-fire. The only thing to do is get the hell out of there. For less than mega-fires, firefighting and clearing can make a difference. But in human terms, the increasing propensity of people to live on the edge of, or in the middle of, heavily wooded areas without large cleared areas around them means that it is only a matter of time before their turn arrives, so the numbers will continue to mount. Thanks to posters who have reminded us that devastating fires have been occurring, irrespective of human activity, for hundreds of years in the US and Australia that we know of. In Australia at least, millions of square miles of eucalypt forest, much of it in rugged and uninhabited mountain areas, means that we are unlikely ever to prevent mega-fires from wreaking havoc from time to time. What we can do something about is people wanting to commune with nature by being surrounded by fire hazards and then blaming others when the inevitable happens. Just out of curiosity, then, which of the following fires in Austrailia can be blamed on global warming? For people to take a disaster such as a wildfire, and tie it to CAGW, is insane. WUWT did not win “Best Science Weblog Awards” by accident. We are faced with a political problem covered with a Faux Science fig leaf. To discuss ONLY science is to ignore the greater problem. As one who volunteered to assist in the 2011 Texas Tri-county fires i saw the largest recorded fire in state history from behind the fire lines. This ~18,000 acre tragedy was from an illegal backyard burn, but given the cyclic nature of droughts there could have been far larger prairie or forest fires prior to recorded history. When the TOP warmists exploit tragedy with NO provable links, then it becomes a topic that must be discussed. If it was only Hollywood pinheads stoking the flames we could ignore the ignorance. The story of the Hinckley fire of September 1, 1894, is a tragic saga of destruction, terror, courage, heroism, and death. Hinckley, a logging and railroad center, was laid waste by the inferno that roared through the town, sending hundreds of townspeople in flight for their lives and leaving hundreds dead in its wake. In attempting to escape the fire, people sought safety in wells, swamps, a railroad gravel pit, and the river. Heroic individuals saved many lives. What caused this historic fire that raced across 480 square miles and burned 350,000 acres? A long drought made for tinder-dry conditions in miles of cut over forests — the wasteland resulting from the unregulated logging practices of the time. A southerly wind blowing over small fires in the area brought in haze and smoking sparks, picking up speed throughout the morning. By mid-afternoon, a large black cloud hovered over the town, and the sound of the wind had grown to a distant roar. A huge fireball set several houses and the depot ablaze, then swept northward through the town and woods toward Barnum. A 37-mile segment of the Munger Trail memorializes the route the fire took between Hinckley and Barnum, the suffering and death it caused, and the devastation it wrought. I can’t imagine that 0.5º give or take over 100 years give or take, affecting mostly the polar regions and mostly after the sun sets is in any way responsible for a single cinder of this. What I see is failure to allow nature to remove the volatiles in the wilderness as it has since time began. So this is ‘what global warming looks like’! I thought it was climate change? Well, it’s hot, we can go back to global warming for now. Until winter, anyway. Low CO2 is a very dangerous thing. High CO2 helps put the fires out. No forest fires on Venus, see? Whenever anyone tries to compare climate skeptics to Creationists, I like to remind them that the skeptics are not the ones telling people that they are going to permanently inhabit an unbearably hot, fiery realm unless they dramatically change their lives. The Oppenheimer quote helps drive this point home rather nicely. So what? The CAGWers also assert that record cold, record snows, earthquakes, ingrown toenails, etxreme constipation, flatulence and whatever other ills may befall us are “consistent” with global warming projections. A hypothesis which “predicts” all tragedies after the fact predicts nothing. These supposed scientists can not apparently recognize geologic timescales…and only superimpose the disasters of the fires (and my heart goes out to the people who lost everything and more) on the urban encroachment of “us”. It disgusts me that people like Masters are involved in this groupthink disaster. It burns me up, that TAXPAYER funded ones like Trenberth are making their shrill voices known, too. Pamela, you are correct on the SCOTUS rulings as of late. Dismal record. Time for all of the reasonable liberty-minded freedom-loving Americans (and the rest of the like-minded world across the planet) to coalesce and put a stop to this nonsense groupthink BS. Fires, droughts, heat ridges, and the like have always occurred. Its just that they are occurring now where millions of people live and hundreds of thousands on a freeway…whereas little to none of them did, a century and a half before. When oh when oh when will we learn to accept this and figure out a way to adapt as opposed to crying chicken-masters-trenberth-little?? Anthony, what role do you see adiabatic winds have in high temperatures and low humidity being experienced today? West coast typically gets hammered when a high pressure system is in the 4 corners area. That’s the cool thing about blogs. There’s the headlines and then there’s the discussion that follows which is chalk full of everything from whining to conspiracy theories to… and this most of all… facts. Look at all the comments in this thread pointing out past history, issues regarding forest management and so on. Is there some garbage mixed in? Sure. Can anyone with average reading comprehension separate the garbage from the facts, do their own research to verify them, and then draw logical informed conclusions? You bet they can. Positive H2O feedback is based in increasing CO2 increasing moisture. However, apparently the scientists are now saying that the IPCC is wrong, that increasing CO2 causes decreasing moisture. And since H2O is a more potent GHG than CO2, increasing CO2 must result in a net decrease in temperature. Which means that temperature increase it more likely due to UHI. Michael “Punitive MWP” Oppenheimer appears to need some clarification regarding the sights and sounds to be experienced by activists, journalists, politicians and pseudo scientists like himself who have been adding fuel to this hoax. Note – there will be a short Vale of Tears leading to an endless Outer Darkness where there will be much wailing and gnashing of teeth. Sceptics will never forgive and the Internet will never forget. Water or Fire, Same BS! Measuring the intensities of wildfires, tornadoes, hurricanes, or even earthquakes by the loss of human life or the damage to human property does not represent a scientific method for correlation to Global Warming. It is inevitable, because of the growth of the human race and its propensity to inhabit increasing amounts of the earth’s surface, that the loss of life and property due to these events is going to rise. I remember the predictions of another group of left wing activists that all of the dust and smoke generated from fires due to a nuclear conflagration would result in a “Nuclear Winter”. Maybe all the smoke from the wildfires can reverse some of the Global Warming we are causing or maybe we should have a nuclear holocaust so we can rid the earth of our destructive presence and generate a nuclear winter to reverse all the damage caused by us. The extremely large canopy fires are caused by man. We have put out the fires for the last 100 years and specifically the last 50, while replacing widely spaced tree forest with new dense pack plantation type of forest of the same exact type of tree. Mother nature never intended for her forests to build up with fuel while the forests are today. The trees are now closely touching each other. She is going to fix this problem. It has nothing to do with CO2. It has everything to do with USFS & BLM. Technically, the Herk is dumping “slurry” — water with a surfactant dye added to make the water “wetter” and serve as a marker so pilots won’t make multiple drops on the same spot. The military is allowed to assist in firefighting after all available civilian operators are on site and the fire is still uncontained — I was one of eight Huey pilots in the New Jersey Guard qualified on the 100-gallon “Bambi bucket” between ’85 and ’01. Usual practice was to fill it from the nearest lake, but I worked a couple of fires where dipping into people’s backyard pools was the only fast option to save a cut-off ground team. Jack, you lost me with the ‘Mother Nature’ bit. What do you think happened before there were any people there, or just a few people? Was it OK for ‘Mother Nature’ to have devastating forest fires (aka bushfires) then – is it only when people are living there that it becomes something that ‘Mother Nature’ never intended? I have huge respect for the work that you and your colleagues do – but pretending that ‘Mother Nature’ never dished out huge, devastating fires before humans began to modify the land is simply untrue. It’s a semi valid point – sure, we don’t NEED to review the bat[snip] crazy claims as they are obviously (to anyone with a brain) stupid. However, it is important to know what kind of cr*p that these muppets are spreading and more importantly to counteract it with proper review/discussion with our fellow man. At work or at play, I am sure we have all come across the blathermouth who ‘supports’ being green (whilst still driving his SUV! ), etc, etc and who reckons ‘this and that’ but seemingly doesn’t understand squat about the subjetc – only what he has been spoonfed from the MSM ? Whether we like it or not, we are duty bound (as responsible skeptics), to correct the misinterpretation and misrepresentation of science and to almost ‘prevent man’s self destruction’ via the CO2 scam, are we not? The point being that in order to help the crazies, we do need to know what kind of crazy we are dealing with! The age of crazy? The age of looking utterly sincere while lying through your teeth, more like. Fully agree with the FAIL, though! Dang. Looking at that picture, it must have really been a downer to be a dinosaur. Breathing smoke all the time and seeing that cruddy orange stuff in the air. No wonder they went extinct. Well, if you want to know how the world looks with uncontrolled burning of fossil fuels, look no further than Monet’s views of the Houses of Parliament”. The last time Eli saw this effect (which is what the picture Prof. Oppenheimer showed shows) was in Erfurt Germany in the early 90s, a relic of what doing everything for industry and nothing for the environment, although the same was available in places in the US before the Clean Air Act. Of course, sand storms caused by terrible ag practices dominated the sky during the Dust Bowl era, reaching as far as the east coast. Smokey Bear says: Only a reduction in CO2 can prevent forest fires. Knowing how the True Believers like to sometimes alter photographs to drive home their bogus points, I found it ironically amusing to see the ‘Photo Shop’ in the picture from Yellowstone Park. We in Australia know a thing or two about bushfires, and having experienced a massive one, I can assure readers that in hot, dry conditions, with a hot wind blowing, and trees, scrub or grass to burn, no human force can stop it. All the finger-pointing about firefighting resources, reducing fuel loads etc is trivial when you are faced with a mega-fire. Would wide fire-stop lanes be of some help in the overall situation? it is certainly its the type of power that they WANT!!! Like the artificially managed forests in California, often Eucalyptus and non native pines rather than the indigenous oak, these forests are dangerous in summer. I’ve seen the aftermath of fires in Spain where the eucalyptus send out fire-starting leaves and bark into the surrounding pine forests. When the inevitable happens and the forest burns down, the next year the whole area is covered with eucalyptus seedling and the burned trunks of the parent trees are bursting into full leaf. The eucalyptus controls its competition by burning it. In Madeira we saw the local ecological park with one end burnt out: guess which foreign tree was responsible. It’s always easy to cry ‘climate change’, much easier than getting work gangs in to clear the invader and restore the natural species mix: even then, of course, it may be a fire-managed ecosystem which will be difficult to explain to those who want something to blame. Otherwise they’d have to learn that Nature is sometimes cruel. But surely the forests burning in the US now are natural, just preserved from burning in the usual, natural way. No-one would plant a dry area with acres of eucalyptus, would they? Someone should tell them there’s no fuel like an old fuel. No more “warming”, “catastrophe” or “doom”? Humans causing a… a… change? 50:50? Wowww! In which direction? Isn’t always anything in change? One useful piece of data missing was the total area forested over the years. Has this increased, as I suspect it has, or decreased, in which case there maybe a problem but with forest management not climate. Not so much climate change as dumb people living in dumb places. How did humans get so dumb so quick? Once we would have accepted nature’s wrath, now we need to blame someone when it rains too much or not enough, or when it’s a bit too warm or too cold. All the time there’s more of us moving into places where we shouldn’t be, places where nature will remind us of that fact in so many ways. Despite increasing temperatures since the end of the Little Ice Age (ca. 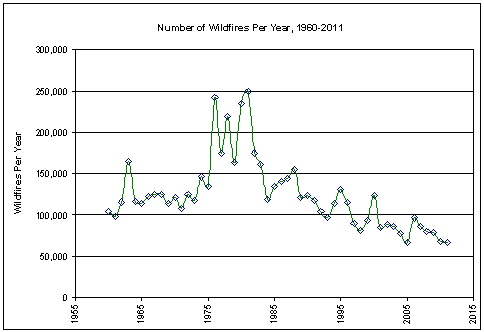 1850), wildfire frequency has decreased as shown in many field studies from North America and Europe. It is important, very important, to understand that the Colorado fires are arson, not “climate change”.- up to two new fires a day for the past week. While conditions are good for a burn, they have not been good for a natural start. There is further reason to be concerned that the fires are terrorist driven, based on recent publications from the middle east which exhort certain “lone wolf” efforts, including the settings of forest fires, in the US. Trenberth et al need to be fully castigated for trying to profit on the tragedy of their neighbours for what is most likely criminality, not nature, as if Trenberth understood anything about nature at all. …. But surely the forests burning in the US now are natural, just preserved from burning in the usual, natural way. No-one would plant a dry area with acres of eucalyptus, would they? The idiots here in the USA are planning on planting winter hardy GMO eucalyptus!! A paper company teamed up with ArborGen, a biotechnology organization, to genetically modify the trees to withstand freezing temperatures. The U.S. Department of Agriculture has just approved ArborGen’s request to plant various test forests across seven southern states…. In the 1850s, eucalyptus trees were introduced to southern California. Over the course of a couple decades, the trees spread across the state. Currently 100 out of the 600 species of trees can be found in California. Initially dubbed the “wonder tree,” the beautiful Australian trees eventually proved more hazardous than wonderful. Compared to the native trees, such as California oaks, the trees from down under support fewer insects, birds and other animals endemic to the United States. Worse, they create toxic conditions in the soil and their canopies block out sunlight for underlying plants. They hog water and yet easily catch fire, relying on fire to spread their seeds. This may be good for the dry Australian landscapes, but not for American cosmopolitan areas…..
Oppenheimer is a Principal Investigator with the Carbon Mitigation Initiative which is sponsored by BP and the Ford Motor Company. “In 2010 Princeton received $11 million from BP to support the Carbon Mitigation Initiative, adding to the $19 million it has received over the last decade through CMI’s partnership with the oil company. The color of dollars is green. “He served as an adviser to former Vice President Al Gore on his 2006 film “An Inconvenient Truth,” and he has consistently defended the accuracy’s of Gore’s film. Oppenheimer predicted: “[By] 1995, the greenhouse effect would be desolating the heartlands of North America and Eurasia with horrific drought, causing crop failures and food riots . . . [By 1996] The Platte River of Nebraska would be dry, while a continent-wide black blizzard of prairie topsoil will stop traffic on interstates, strip paint from houses and shut down computers,” Michael Oppenheimer, published in “Dead Heat,” St. Martin’s Press, 1990. This is good news bearing in mind there are more people, more campfires and more arsonists (I speculate here). It’s better than we thought!!! Primarily, this year’s fires are bad because we’re in one of those stuck phases of the jet stream, just like the 1930’s. Dry areas stay dry too long, wet areas stay wet too long. Nothing to do with ‘Global Warming’ in the usual sense of the word. Secondarily, this year’s fires are worse than usual because Global Warming pseudoscience, along with Biodiversity pseudoscience, has caused a drastic drop in logging. Since the usual sense of ‘Global Warming’ means a wildly false pseudoscience that maximizes Wall Street profits, the attribution to ‘Global Warming’ is technically correct for this part of the cause. Devastating as those wildfires in Colorado clearly are, you might have a teeny thought for us in the dear old UK, barely scraping 60 degrees (F) at the back end of June, serious flash floods in the northeast of England; and depression after depression rolling in off the Atlantic…. All of course due to global warming, or whatever its called this week…. My brother and sister-in-law live in Colorado Springs and their house was a mere 2 – 3 miles from the eastern edge of the Waldo Canyon fire. Fortunately, as of this morning, it looks like their house will be spared (fire is now 15% contained). It is important, very important, to understand that the Colorado fires are arson, not “climate change”.- up to two new fires a day for the past week. Oppenheimer is the guy that said AGW was going to cause massive Mexican migration to the USA. Would not the prospect of death by forest fire mitigate against that? I like the Photo Shop sign in the middle of the second picture. I shouldn’t laugh at this but I can’t help myself. The historical coincidence is very funny as Adobe Photoshop seems to have been started in the summer of 1988. Yes and no. If you look at historical photos of the American west from the periods of the gold rush and shortly after you will see that this part of the country was largely stripped of accessible trees by the early settlers. The natural burn cycles in this area is for the forest in a given area to burn about every 75-80 years or so according to a local forest ranger I talked to several years ago. Yesterday afternoon we had a thunderstorm sweep through the Boulder Colorado area. Its lightning strikes set 3 or 4 fires. By 4:00 pm there was only one small burn still active due to the rapid availability of helicopter water drops and fire crews from the already active fire fighting efforts for the Flagstaff fire. The same thing happened the day the Flagstaff fire started the lighting not only set the Flagstaff fire but also started a grass fire less than a mile from where I work. Under the current fire conditions, a single thunder storm can easily start several fires in a matter of minutes. Agree, that histogram is all screwed up — that image has had the red chanel enhanced and the blue chanel reduced “for effect”, if you put them back in balance you get good old neutral gray smoke haze, which is what the entire Colorado front range looked like when the smoke pooled in cities near the fires. This must be the funniest website on the net! Some of the comments are comedy gold. Is not just Colorado fires, Spain (and most of the Mediterranean) has broken historic heat records for 5 days this week. Some of these broken records broke last years already record breakers for June. Stop thinking locally. You either get the whole picture (global) or you’ll never get GW at all. our towns surrounded by prickly acacia that burns like a bomb even in winter. and masses of bracken fern. councils not able to cut the acacia due to it being labelled protected..the fern is removable but you cant get one out, without the other…and then they approved masses of Pine and bluegum plantations right up to withing half mile or less of the towns borders and homes. power line dropped in high winds a few months back..only the wind changing saved the town. lesson being learnt the hard way! banning grazing in high country, while removing funding for roadside vegetation and feral animal controls. now thats the smart green mode. until we get the Liar and greens OUT! we’re in for more of this idiocy in spades. Doen’t anyone (I am telling my age) remember all the advertisements on Smokey Bear Prevent Forest Fires? It was very very big in the 50’s & 60’s. Thus we use to put out forest fires, in fire environments, instead of letting the small fires burn off the debris that compete for growth with the native fire environment plants. In fire environments, the native plants need the low temp fires to open the seed coats to grow and to burn off the competing non-native plants. So man has had a strong influence, just not the “CO2 climate change” one. this is so true. simple and straight to the point. I would like to underline your question, HOW DID HUMANS GET SO DUMB SO QUICK. I doubt that that was his point. Humans make it worse by not allowing regular burn offs. Yes there have always been lightning strikes causing huge fires but when you have areas that have not been cleaned up or allowed to burn you get a huge amount of fuel that would not have occurred. the fire in Kelowna BC are a prime example. You couldn’t walk through that area without seeing 6+ inches of “fuel” lying around everywhere. They won’t have to worry about that for a while now. Hopefully we learn and either clean out the fuel or let nature do it more often. Well, yes, but since the design concentration for deep-seated Class “A” fires is 65-75% CO2, you don’t want to be in the area without a SCBA. June 28, 2012 at 11:37 pm	Jack, you lost me with the ‘Mother Nature’ bit. What do you think happened before there were any people there, or just a few people? I used the Mother nature bit as a joke. I was completely serious in the structure of the forests today. Historically, forests had extremely large trees spaced apart. There was multi generation of trees of different sizes below the massive trees. A fire burned the duff (tree dandruff for firefighter slang knowledge) and smallest trees below the massive ones. This process revitalized the forest, allowing sunlight to reach the ground, and start a new geration of trees. You do realize that some trees only reproduce after a fire? The forests of North America, specifically the western US, was made up of large numbers of different types of trees. The world has never naturally built a forest of dense pack plantation trees of all the same age. The fire can easily and quickly get up into the Crown. From there the fire, pushed by winds, races through these forests killing all plant life. The fires of today, are catastrophic to the forest, compared to the old fires that ran hundreds of miles, but only burned the last few years worth of seedlings. So, Yes, I stand by my statement. Fires of today are much worse then before, because of Man Kinds actions. Those actions were driven by people like yourself who didnt understand the ecology they were adjusting. However, the low humidity responsible for the fires DIRECTLY CONTRADICTS the IPCC notion of positive H2O feedback. And without positive H2O feedback, there can be no CAGW. What we have here is “scientists” continuing to cherry pick data to try and frighten the public into increasing government funding for climate scientists. If engineers or accountants did the same, they would quickly end up in court. Academics however hide in their ivory towers, refuse to make data available to the public, even though the public paid for it, and cry “academic freedom” whenever anyone tries to look at their “cook” books. This is scientific corruption. Must be nice being a scientist. Never having to worry that by spreading false science you are driving thousands of companies out of business, leaving millions unemployed in their wake. Is it simply a coincidence that the largest financial collapse since the great depression occurred at the same time that climate science and the IPCC was trying to ram carbon trading down the throats of the peoples of the world? If you believe it was coincidence, then Al has a bridge he wants to sell you. No they will be investigating because some local official asked them to. Just because there is an investigation does not mean they will find anything. At this point you are just spreading rumors if you assert with no qualification that the fires were arson caused. We have lots of examples of multiple fires caused by lightning strikes, that is well documented. So at the present the most likely answer is natural causes, or accidental (ie the Last Chance wild fire was started by sparks from the wheel or a car that had a blow out). Could one or more fires be suspicious? Yes. Is it responsible to flatly declare a conclusion before he investigation has even been done? NO. Lets not get the cart before the horse. It’s about how global warming activists flummoxed the Reagan Administration into allowing the creation of the IPCC. What you realize is from reading it is that they had the narrative before any real science had been done. They had the templet and once they had that, the scientists knew how to channel their research to help fill in the narrative. Oppenheimer wrote this before Climategate and given the arrogance of it, I’m surprised it’s still available on the internet. Herein lies the obvious fact that the enviros choose to overlook. Fire is a NATURAL and REGULAR part of the ecology of the western US. It stretches from spring thaw to first frost. Some years are worse than others (natural variation). There are over 245 million acres of land that can burn. At an average of 4-6 million acres per year that means the mean time between burns for any given acre is 40 to 60 years. Many plants have evolved to actually *depend* on the periodic wildfire for their life cycle. Redwoods and Sequoias have evolved the ability to survive multiple forest fires over their lifetimes. Lodgepole pines NEED fire to release seeds from their pine cones. Which is quite amazing as I wasn’t aware of the ability of loud noises to start fires. I thought that happened from lightning that isn’t going cloud to cloud but cloud to ground (or is that technically ground to cloud?). Sometimes fires will put themselves out by generating Pyrocumulus clouds, leading to precipitation. But larger fires can lead to pyrocumulonimbus clouds with lightning that can cause and spread fires. On topic, Dry lightning and dry thunderstorms cause the majority of wildfires in the Western US. This is scientifically confirmed by the linked piece, which is undated but apparently circa June 2008, original source unknown but it is noted as edited, found on a Green site, that importantly notes “Global Warming Fuels U.S. Forest Fires” while bemoaning how the US’ western forests are becoming carbon sources instead of carbon sinks due to the longer wildfire seasons and increased potency. It apparently is a press release for a Scripps Institution of Oceanography paper, at least partially, although missing info about where the paper was or was to be published. I found it as a reference for the Wikipedia Dry thunderstorm entry, which of course is just fine and dandy since it fully qualifies as scientific evidence for an IPCC report. Why don’t “foresters” tell us that the rise and fall of fire frequency is cyclic and results from accummulation of deadwood. There will be silence for decades after a few heavy fire seasons because during the renewal that takes place after the fires, there is no dry tinder to light. Doesn’t this Openheimer fellow get paid to say things like this? From around the start of the twentieth century to now, I’m getting skeptical that we’ve gotten any net GW at all. …. Usual practice was to fill it from the nearest lake, but I worked a couple of fires where dipping into people’s backyard pools was the only fast option to save a cut-off ground team. Now that would be an interesting conversation. Exactly Larry. We’ve have had twelve fires in Colorado this year according to InciWeb. Five were lightening caused. Three are ‘Human-under investigation’, one is ‘Human-inconclusive’, one is ‘Human’, one was prescribed burn by the Forest Service that got out of control, and the Waldo fire is ‘under investigation. I would have expected the human interaction to be less, but then there are more people here than 40 years ago, when I first gained a sense of Colorado. Also, I escaped the front range twenty years ago, and try to ignore the staggering growth that has since occurred there. You missed the most important indicator in that phrase that something isn’t right… the word EARLIER. Just like the Tornado season started EARLIER or Tropical Storm Debbie which claimed the earliest 4th storm of the Atlantic Hurricane season (previously was July 7th). If you move across the Atlantic and you’ll find similar story. It is logical result of adding heat to the Earth climate system. Since you did not use the /sarc tag I guess you are making the very misinformed assumption that “thunderstorm” only refers to clouds that go boom in the distance and little lightning hits the ground. Out here when we talk about thunderstorms it is an all inclusive term which includes lots of cloud to ground discharges. Each storm is a bit different some have more than others. The storms we have had the last few days produced considerable numbers of direct cloud to ground stikes. In this part of the country a good healthy thunderstorm can have dozens of cloud to ground strikes per square mile. The really energetic ones put out quite a light show. As a storm watcher you get an front row seat to these light shows, and I have witnessed many cloud to ground strikes within my circle of view in just a matter of minutes. Direct strikes to power poles, strikes to trees and in one case a strike to a huddle of cattle which killed about 6 of them across the road from where we were sitting. These are not storms that just make distant booming noises, but constant displays of cloud to ground strikes typically one every 15 – 60 seconds at the height of the storm. The observation came directly from a Colorado Springs town councillor in a video interview. I’ll leave to the local gendarmes to verify the accuracy of it…. I had guessed that given how long I’ve been commenting here, as well as the other wonderful content of that comment, you’d know that “sarc” is my default setting and was clearly evident there. Guess we were both wrong. My mentioning “thunderstorms” and the different lightning was in the same vein as my complaining about the phrase “thunderstrike”. It’s the lightning that does damage, not the sound! Or a logical result of the current meandering of the jet stream. And that “similar story” across the Atlantic? Which planet? This year the past winter and the current summer are both colder than normal in Europe. Also explained by a shift in the jet stream. The photograph kind of looks like what I imagine the atmosphere would like, if I was a Predator wearing a heads up display (HUD) that provided vision in the thermal infrared region of the EM spectrum. That idea is built on the likely range of ir radiation in the air when CO2 is present. That range might even be a lot less with water vapour taken into account. I reckon if you guys could actually see in the thermal ir part of the EM spectrum there would be a lot less of the “trace gas” chant and a lot more laughter. Jack, I am Australian, and massive fires and species that need fire to reproduce are in my DNA. I cannot comment on the composition of US forests, but your statement that “The world has never naturally built a forest of dense pack plantation trees of all the same age” is simply untrue. The great eucalypt forests of Australia can be exactly like that, having all grown up since the last apocalyptic fire which left nothing but ash for hundreds of square miles. All the trees are the same age, and as they get bigger, being eucalypts, they kill almost everything else that grows around them. There is nothing unnatural about it. Human intervention is irrelevant, because it cannot prevent the mega-fires (started by lightning strikes in remote mountain areas) that have been happening here for thousands of years. I do understand the ecology, and am certainly not claiming to be able to adjust it. I have met people that have never seen a major lightning storm in their lives and are dumbfounded by the intensity of a strong thunderstorm. It all depends on where you have lived all your life. Your right I misread your comment but frankly I do not put much energy into trying keep track of who posts in what style, given the number of people who regularly participate here with only a handful of exceptions I don’t try to cubby hole people into various classifications. Seems every time I do that I find out that someone I agree with strongly in most things will sometimes come in completely from left field (from my point of view) and strongly disagree on some issue I think is not of much consequence. Add the fact that many times the post is made while trying to do 3 other things sometimes leads to mistranslations of this sort. Wow, man, that’s deep. Whoa. Hey man, I don’t want to harsh your mellow, but you got some seriously strong shiite there. Don’t hog the bowl, man, pass it around so someone else can see all them groovy colors. Wow man, thinking you is seeing stuff like an alien would, that’s just… really deep, man. C’mon, share the love man! If you are saying Australia, I have no comments. I have never been there. If you are talking about the Western US, which I believe this whole exchange is about, and the article was about. Then I again completely disagree with your comments. You keep taking the basis of the article above and twisting it to Australia. Johanna, I used the word “Plantation” that was to designate that the forests are artificially planted by humans in this way. You didn’t like me using the word “Mother Nature”, You don’t like saying “The World” when discussing a man constructed forest. How do you want me to say this? Denying reality isn’t going to work. Like a fire, reality is reality. The forests of the Western US are actively managed for fire. We use smoke jumpers to sky dive into them. They are backed up by grunts like myself who catch Helo Flights into the back country. We are backed up by “bombers”. If roads are nearby, fire engines are deployed and we run water hoses as far as a mile. I can guaranty that Man Kind does stop these fires quickly and before they get a chance to burn off the “duff”. The forest bed is a dense pack of fuel. Again, your statement that man kind does not affect the forest make up is categorically false in the US. If you are referring to Australia, I can only say you might want borrow our Firefighters more, I know that Australia regularly borrows our bombers… We are good at this stuff. The world has never naturally built a forest of dense pack plantation trees of all the same age. I used the word “Plantation” that was to designate that the forests are artificially planted by humans in this way. So, which is it? I never claimed that humans could not create a forest of same age trees, but you wrongly claimed that a forest of same aged trees has never been naturally built. I never claimed to be speaking for US forests, but was simply refuting your statement about ‘the world’. Oh, and the snark about firefighting abilities was really uncalled for, not to mention inaccurate. You Masters of the Firefighting Universe seem to have your work cut out for you just now. When you geniuses have some spare time, you can come and put out a lightning strike fire in the middle of thousands of square miles of uninhabited eucalypt forest in a rugged mountain range, and maybe show us hayseeds how it should be done. After you’ve put out your own, that is, and prevented all future occurrences. How about next Tuesday? johanna says:	Oh, and the snark about firefighting abilities was really uncalled for, not to mention inaccurate. My crew was contacted about relocating to Australia in our winter downtime, to help fight your fires because our bombers were already deployed and you needed more professionals. My snark was based on facts. Sorry to have upset you. Again. Also, I apologize, I don’t consider the weed you are referring too, to be a real forest in the context of Suger Pines, Redwoods, Douglas Fir. Ie Big Timber. By the way, nice spin out. I never claimed to be any of the things you accused the hard working firefighters of being. Interesting reply. According to NCDC, the trend of Spring rainfall in Colorado is unchanged since 1950. Although this year it was low, it was still only 4th lowest in that time. Equally the same applies to winter precipitation. Judging by the looks we got, I think that was their first reaction. Except for the color, that’s what an IR image looks like when there *is* a lot of water vapor in the air — IR imagery is typically black-hot (blackimage on white background) or white-hot (white image on black background), depending on the polarity you opt for. Ambient temperature per se has absolutely no effect on image quality. Water vapor affects the imagery because it scatters the heat being produced by the target. I’ve been using NVGs/NVDs (which “see” quite nicely into the near-IR portion of the spectrum, thank you) and thermal imagery targeting systems for longer than you’ve been alive — the only laughter you’re hearing is mine, because your statement was ludicrous. Here on the Nevada side of Lake Tahoe, we have excellent and ongoing fuels management efforts. On the California side, where money is in short supply, it’s not done to the same extent. Result: California communities are far more vulnerable to large fires. If you want to understand why these fires become so large, look no further than the amount of work done on forests in the years prior to the fire. …and didn’t you know that the Jet stream has lost strength because of global warming? Here Mr Liu speaks of winter but the same pattern applies all year around and with heat. As the Jet stream gets weaker more pockets of cold air move down towards the equator (and warm air northward). It is weaker because the difference in temperature that gave strengh to the Jet has decreased. Because Arctic temperatures are way above what they should be thanks to GW. I have met people that have never seen a major lightning storm in their lives and are dumbfounded by the intensity of a strong thunderstorm. Larry, the Tstorm last nite here was producing a lightning strike about once every half second at its height. I was blinded & cringing watching it. Power went out for 12 hrs. Because Arctic temperatures are way above what they should be thanks to GW. Arctic temperatures are cyclical. What do *you* think they should be at this particular point in their cycle? In the west, when it gets colder, we get drier. The 1970s were very cold ( it snowed in the Central Valley) and very heavy drought ( I learned to ski then on nearly bare slopes and with straw on the bare parts.). When we get drier, we get more fires. Big fires are not new, either. There was one topic presented, however, that was particularly troubling. 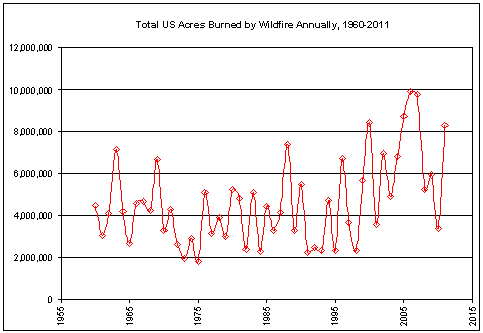 Namely, wildfires have been increasing in size over the past century. 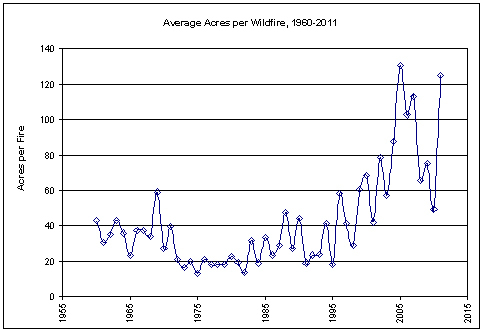 The speaker used a graph to illustrate his point and then suggested this trend has been caused by past fire suppression. Fire suppression, according to this speaker, has allowed unnatural levels of fuel to build up across all ecosystems. The speaker also implied huge, catastrophic fires are a modern phenomena and firefighting agencies (USFS, etc.) are to blame. These conclusions are not supported by the data. 1825 Miramichi fire in Maine; 3 million acres; 160 dead. 1846 Yaquina fire in Oregon; 484,000 acres. 1848 Nestucca fire in Oregon; 320,000 acres. 1865 Silverton fire in Oregon, 1 million acres. 1868 Coos fire in Oregon; 296,000 acres. 1871 Peshtigo fire in Wisconsin; 3.78 million acres; 1,500 estimated dead. 1876 Bighorn fire in Wyoming; 500,000 acres. 1881 Michigan forest fire destroyed 1 million acres, 282 est. dead. 1889 Santiago Canyon Fire, Orange/San Diego Counties, California, 300,000 acres est. total. 1894 The Hinckley fire in Minnesota; 160,000 acres; 418 dead. 1903 The Adirondack fire in New York; 450,000 acres. 1910 Great Fire (Idaho & Montana) 3 million acres+, 85 dead. 1918 The Cloquet fire in Minnesota. Cloquet; 400 dead. 1932 The Matilija Canyon fire, Ventura, CA; 256 square miles. 1933, 1939, 1945 and 1951; Oregon coast range. 355,000 acres. 1947 Texas; in September and October, 900 fires; 55,000 acres. 1947 Maine; series of fires; 175,000 acres burned; 16 died. 1988 Yellowstone N.P., Montana and Wyoming; 1 million acres. 2003 Southern California Firestorm; 748,017 acres, 14 fires; 24 dead. Obviously huge fires are not a modern phenomenon and have occurred long before fire suppression began. The fact that one of the largest fires in US History happened forty years before the government began its massive fire suppression efforts is an issue typically ignored by the “bash Smokey Bear” crowd. It is also important to note that some of the earlier fires were caused by poor logging practices. Logging slash (cut limbs, unusable wood) was left lying in huge piles across the landscape. It is a whole lot more related to fuel management than anything else. THEN normal weather cycles. THEN humans in the forest and accidentally setting fires ( or deliberately – even by authorities doing “forest management” that gets out of control). I picked a random fire from your list, did a search and found what I expected, …the fire happened in August. I’m sure if you check the others you’ll find a decent 95% happened in the months of August, September and October. If I recall well from similar list elsewhere there are a couple of odd ones in April and February and one was caused by Native Americans as this helped the buffalo. That will depend on the ‘cycle’ you compare it with… 1, 10, 100, 1000,10000,100,000 years ago? The speed in which the warming is occurring can’t be explained by natural variation alone. Solar output is low, volcanic activity is low, no asteroid impacts, Enso neutral, and so on. It is happening too fast for the Milankovitch cycle to explain it. The speed in which the warming is occurring can’t be explained by natural variation alone. And then got colder again. Naturally. Sorry Bill! I meant PezdePlata! And it’s still significantly colder than 2,000 years ago when the Romans planted wine in England (archeological evidence) and the Chinese figured out how to use chrome (same evidence.) And still colder than about 1,000 years ago, when the folks in cold Denmark planted wine (today’s wine “border” in Europe is barely in middle Germany) and Murasaki Shikibu in Japan wrote the first novel of mankind. That all indicates that culture, globally, was blooming. How was this possible? Because it was significantly warmer globally back then than it is today. I know Mann’s latest graphs state that’s not true, but that guy has some serious issues with history, so he tends to conveniently “forget” it. Plus, our emissions make a small percentage of the CO2 in the atmosphere. Are you telling me that a 0.01% variation of the atmosphere in the past 50 years is doing this? Then show me the undeniable proof. And not stuff like Al Gore claiming that an atmosphere with 100% CO2 is the same as one with 0.039%.